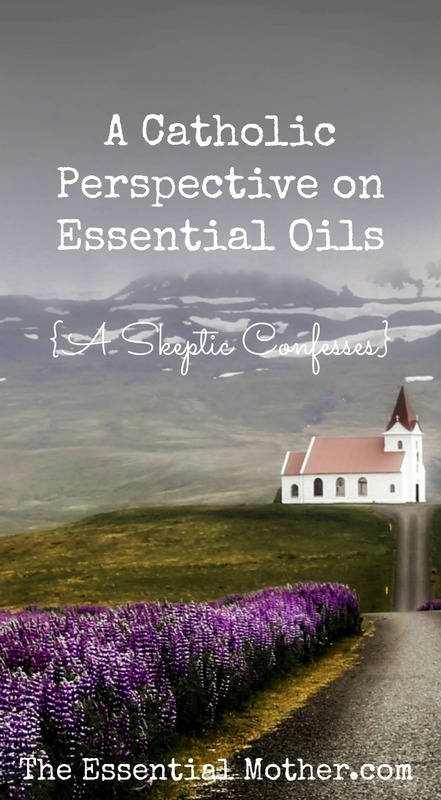 The first time I heard a friend talking about essential oils I confess that I pretty much tuned her out. She might as well have told me that she was using crystals to heal her broken aura while burning sage smudge sticks for the shaman. My head nodded politely but I was probably thinking about dinner... or wallpaper... or something. My dear cherished friend... I am very sorry. Up to that point, my experience with "natural" healing came primarily from my familiarity with New Age enthusiasts who made up the majority of the stereotypical alternative medicine crowd that I knew. And when I walked away from that environment to embrace my Catholic faith, I walked away from everything that I associated with them. Take your patchouli incense and yoga and go find your reincarnated Buddha... I want none of it! I needed that distance at the time. I needed the clarity. But ultimately, I discovered that in multiple respects, I had thrown the proverbial baby out with the bathwater. I'm saying that the natural world belonged to God first... And that I am seeing things rightly ordered for the first time. If something is good, true, and beautiful, it isn't freaky or nutty... It's wholesome and designed to support us in our vocation in the service of God. Yes, I threw out the crystals, the spiritual yoga, and the Buddha. But there have been a few things that I have reclaimed as a Christ-follower, understanding with a clearer vision that their goodness is a gift. One of those gifts is essential oils. We know experientially that the natural world provides real solutions to illness and disease. We love the smells of nature and buy the products that feature them. We walk in beautiful places because we instinctively know that it is good for mind, body, and soul. We breathe it in, feel it on our skin, and bring it into our homes. We slather stuff all over our bodies until we smell like walking orchards and flower gardens. Whole industries have grown out of our desire to be smelly like things that grow from the earth and to heal our bodies with the same. We crave it. We literally salivate over the smell of cookies. We boil cinnamon and cloves to feel festive and happy. Oregano, for example, has anti-bacterial and anti-fungal properties which can be demonstrated in a lab. We know also from clinical studies that frankincense oil has the ability to penetrate the blood/brain barrier and has a supportive impact on cellular health. Orange oil has anti-inflammatory properties and acts as a kind of anti-depressant by stimulating the senses. What we forget, however, is that these benefits aren't restricted to a scientific lab... but available to anyone with access to these potent plant compounds. Pure essential oils are simply distilled plant compounds; potent, concentrated, and straight from God's creation. Their molecular structure allows them unique access to our bodies at a cellular level. There's nothing freaky, nutty, or unexpected about that. God's intelligence and benevolence is made manifest throughout all of creation. For those who have followed my journey through sickness and health, you know how seriously I have had to take this discussion. Out of real necessity, I have looked beyond traditional medicine for help and found it through nutrition, movement, and environmental changes. One of those changes has been the use of essential oils. My body responds to essential oils. God is good. He loves us. He provides for us. He gave us amazing, beautiful bodies, the materials of the earth to serve those bodies, and the intelligence to use them. That applies to natural as well as traditional medicine. They both have a place. The natural world belongs to God. He is master of all creation and just because non-believers use a plant or move their bodies in a non-sacred way, does not make them master over those things. Catholicism, more than any other religion, recognizes the beautiful integration of mind, body, and soul. We are charged with the care of our bodies and the earth and it is entirely consistent with who we are as Christians to recognize the gifts inherent in the created world. The Church herself uses oils. At the Chrism Mass on Holy Thursday, her bishops bless them for use throughout the year. They fill our sensory memories, carry symbolic significance, and are used as sacramentals. After our babies are baptized, we breathe in the balsam that was touched to them and regret that we ever have to wash it away! Frankincense has long been used in liturgical celebrations and was even given to Our Blessed Lord as an earthly gift, and was considered at the time to be a medicinal treasure. We do not worship the created over the Creator... but neither can we wholly remove the gift from the Giver. Essential oils are potent. I would never advise using them without proper knowledge and care. It's not complicated but does take a certain amount of awareness. Like any tool, they can be misused. I dilute my oils so that they are safe enough even for the kids in my family. I research and keep charts on hand to make sure that I'm using each unique oil in the proper way. I was probably more surprised than anyone when my interest led me to earn my certification as an aromatherapist. And what I found through that training is what I had already learned through my own experience: that essential oils are an affordable, safe, and effective health care option. It is good to know that there is nothing inconsistent about natural health options and a strong life of faith. God's creation is magnificent. Thanks be to God! When I was 35, I sincerely thought I was going to be in a wheelchair by the time I was 40. I was that sick. I am now 41 and nowhere near that wheelchair. Doctors couldn't help me. But I changed my diet, my lifestyle, my environment... and God gave me new life with which to serve. I want that for other people. So many are suffering. Maybe someone out there will benefit from my story. I did a lot of research before choosing a company. And truthfully, I left one popular essential oil company because I was not happy with the integrity of the leadership or the quality of the oils. It was uncomfortable. But my first priority is to my God, my vocation, my family, my health... not to a company or to my friends. Since I have to purchase from somewhere, I still had to find a source... and I did choose one that seemed more in line with my priorities than the others. I have decided that I can stand behind these essential oils enough to become a Wellness Advocate with doTERRA. That means that I get to bless my family by doing what I would already be doing: Sharing wellness. So many of us are sick, hurting, exhausted, seeking joy amidst the physical struggle, and having a hard time staying afloat. Essential oils are not a magic cure... but they can be another means of supporting our amazing bodies. God is good. If you are interested in learning more, just contact me HERE or start at the link below... "Why Essential Oils?"